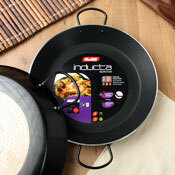 Before First Use - To help remove the label, warm the bottom of the pan slightly, then peel the label off. Next, boil several cups of water in the pan to help remove the clear protective finish. 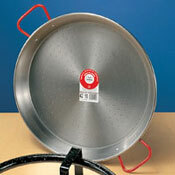 Follow this by washing the pan by hand with soap and water, and then immediately dry. Finally, rub a small amount of vegetable oil on the pan to prevent rust. 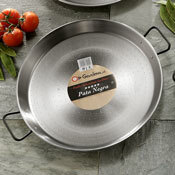 Never store a pan when wet and never allow it to air dry; drying it immediately will help prevent rust. 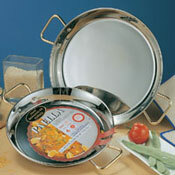 Polished steel pans are not dishwasher safe, and are not recommended for electric cook tops. Always oil a pan before storage to prevent rust. Discoloration (turning blue-black) is normal and is an indication that your pan is ‘seasoned’ and has been properly cared for. 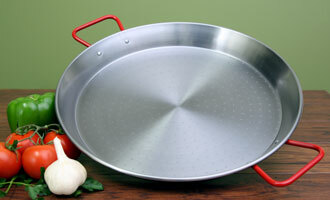 If your pan does rust, simply clean off the rust with a scouring pad or light sandpaper, then re-oil.